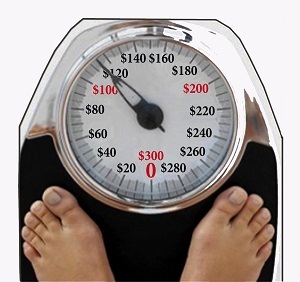 Saving money is a lot like losing weight. It’s no fun, requires sacrifices and no one at a dinner party wants to hear about your plan. For many first-time home-buyers, trying to save enough money for the down payment on a house can seem like a diet that won’t end. It might even be tempting to click one of those email links that promise magical results, even though you know there’s no magic pill for weight loss and no magic plan for saving money. One of the biggest mistakes new homeowners make is buying more house than they can realistically afford. At CORE, we want to get the right loan for you so that you can move into the home that’s comfortable and fits your lifestyle. That doesn’t mean you have to use every dollar you qualify for. Let’s talk it through to figure out exactly how much you can spend every month and make sure you don’t get in over your head. A good rule of thumb when planning is that you want to put down around 20 percent of the sale price. Before the financial crisis, a lot of people were putting down 10 percent or considerably less – as much as 0%. It didn’t turn out well for many of those folks, nor did it for their lenders. Even if you feel comfortable with the risk that comes with a low down payment, putting down more money now can lower your interest rate, so you’ll pay less money in the long term and have a lower monthly payment. It’s easy to see the down payment as your goal and forget about the rest of the mortgage, but this won’t be the last purchase you make. You’re going to want to save for college, retirement or your dream vacation. If you don’t put the money in now, you’ll have to do so later, and you’re essentially taking a loan from yourself against those future purchases. You may be making sacrifices and saving as much as you can, but still not feel like you’re getting any closer to your dream home. You’re not alone. Unlike their parents or grandparents, today’s typical middle class family has more than one job, and a surprising number of those families has three or more sources of income. Even with the popularity and necessity of taking on a second job, some people are embarrassed to do so, as if having a working spouse or taking on extra work on the side is a sign of failure. Don’t be that person who’s too embarrassed to go to the gym because they don’t want anyone to see them get healthy. There’s no shame in working. Most people keep track of their weight every day while dieting. Some keep a food log. Some count calories, points, or carbs. The bottom line: You need to be able to see how you’re doing so you know when you can splurge and when you need to cut back. The same is true when saving for a home. Make a budget and stick with it. If you have a bad month, don’t get frustrated. Instead, commit to doing better next month. When you save money every month, where does it go? Do you have a series of Mason jars filled with crumpled singles? Is it sitting in your share draft account, looking pretty when you check your balance but not doing anything else? Even if you keep your money in one of our savings accounts, there’s a lot more we can do to help make your money work for you. We have a variety of great savings plans, from low-risk savings certificates to interest bearing checking account for your deposits. If you want to own a home, you need to save money, but you don’t have to do it alone. Think of us as your personal trainer for your financial health. Drop us a line at 912-764-9846 and we’ll help you figure out what you can afford and how you can get there. Our plans are always easier to swallow than a kale smoothie. But then again, what isn’t?